Researchers at University of California San Diego School of Medicine have come across a wonder material that could be used for a number of research and clinical applications, including drug testing, application of selective painkillers, creating light-controlled pacemakers and treatment of cancer. The study published in May 18 issue of Science Advances, talks about the wonder material ‘Graphene’, a semi-metal composed of single layer of carbon atoms, which is known to be extremely sensitive to light (1,000 times greater than conventional digital cameras and smartphones) and can convert it into electricity. Hence, the researchers decided to examine whether the electricity generated out of graphene had the capability to stimulate human cells. After experimenting with different light intensities, Alex Savchenko and his team discovered that cells could actually be stimulated via optical graphene stimulation. “I was looking at the microscope’s computer screen and I’m turning the knob for light intensity and I see the cells start beating faster,” said Savchenko, first author, PhD, a research scientist in the Department of Pediatrics at UC San Diego School of Medicine and Sanford Consortium for Regenerative Medicine. “I showed that to our grad students and they were yelling and jumping and asking if they could turn the knob. We had never seen this possibility of controlling cell contraction.” Savchenko led the study with Elena Molokanova, PhD, CEO of Nanotools Bioscience. 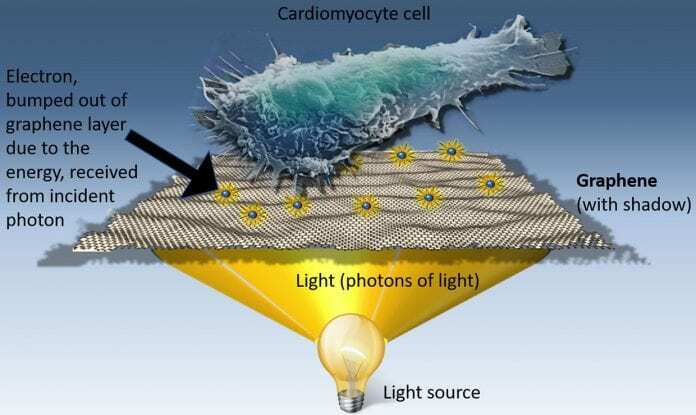 The researchers found that they could control human heart cells growing in a dish by controlling how much electricity the graphene generated by changing the intensity of the light to which they exposed it. The cells could be manipulated to beat at wide-ranging rates such as 1.5 times faster, three times faster, 10 times faster, or whatever they needed. Savchenko and his colleagues also discovered that could similarly control heart activity in a living organism (zebrafish embryos) using light and dispersed graphene. Such optical graphene stimulation is significant, as Savchenko believes that it allows researchers an approach to tradition cells as if they are inside the body. This will allow researchers to make the graphene imitate a pattern of electricity similar to various heart diseases, making it easier for them to test heart medications and other new drugs, and also make better optical pacemakers. Further, the study says that many biomedical research that depend on individual cells or cell cultures grown in plastic petri dishes or on glass plates to artificially stimulate a pain response in neurons that can be substituted with cells grown on graphene that in fact would provide a more realistic environment than standard plastic or glass laboratory dishes. Currently, the team is concentrating on heart cells and neurons, but they are also looking to ultimately apply their graphene/light system to search for drugs that selectively destroy cancer cells, while leaving nearby healthy cells unharmed. Last but not the least, Savchenko believes light-controlled pacemakers made of graphene could be safer and more effective than current models. While all these appear to be an uphill task, but Savchenko is optimistic. “You can squeeze a half-year of animal experiments into a day of experiments with this graphene-based system,” he said.